This is really an interesting and exciting shooting game. Recently, a group of mysterious organization came around with their own armed forces and military. You received the order to destroy the enemies by using the mobile mouse for aiming and click it for shooting, and use “A” and “D” to move.Your goal is to kill all the terrorists and resistance as possible with your reasonable control and rational skills. The guys who like trying new things must have a try! You can play Time Soldier free online shooting games at fogames. 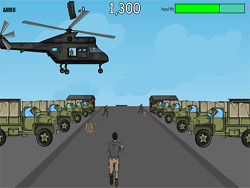 It has tags: Army,Action,War,Shoot Em Up,. It has 5297 total plays and has been rated 90.4% (87 like and 33 dislike), find the fun and happy day. If you want to play more shooting games, we find some of the game: Zombotron 2 Time Machine, Time Travel Survival 2, Time Travel Survival 3 and Time Travel Survival. To play other games, go to the army games page, the action games page, or just check out the new games or best games page. Play Time Soldier online games, Fun and Happy.